Happy St. Patrick's Day! I made a dessert at the last minute for today, so apologies that this recipe is probably going up a little too late for anyone else to actually make this year. Unless you're a big fan of Baileys and you just want to make it any time of the year. I'm not actually too keen on the stuff, but I thought it would be nice to make this for my workmates who are celebrating today. 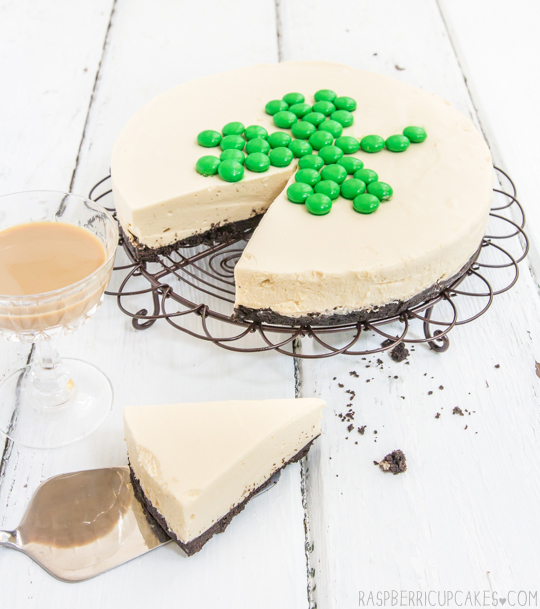 A cheesecake for Irish Cream lovers, it has a strong kick to it that might not be to everyone's tastes. Sorry for the radio silence over the last couple of weeks, it's been a hard slog. Unfortunately things are going to be pretty nuts for the next few months, so weekly posts are becoming harder and harder. It's starting to drive me a little batty, I love baking up a storm and making a big mess in the kitchen and I start to get antsy if I haven't baked in a while. So this weekend I made this cheesecake! It's the chilled kind, so it was really quick to make. Well it would have been really quick to make if I had made it correctly the first time. I swear everything I've made in the last month I've had to redo at least once because of a dumb mistake I've made. It's not a good precedent, especially when I'm making my first wedding cake at the end of this month. Eek! I also got a little tipsy from tasting the mixture a lot, it definitely has a kick to it. I reduced the amount of Bailey's on my second attempt, and you could reduce it even more if you want a milder flavour. I went the an Oreo crust this time. I do love an Oreo crust. 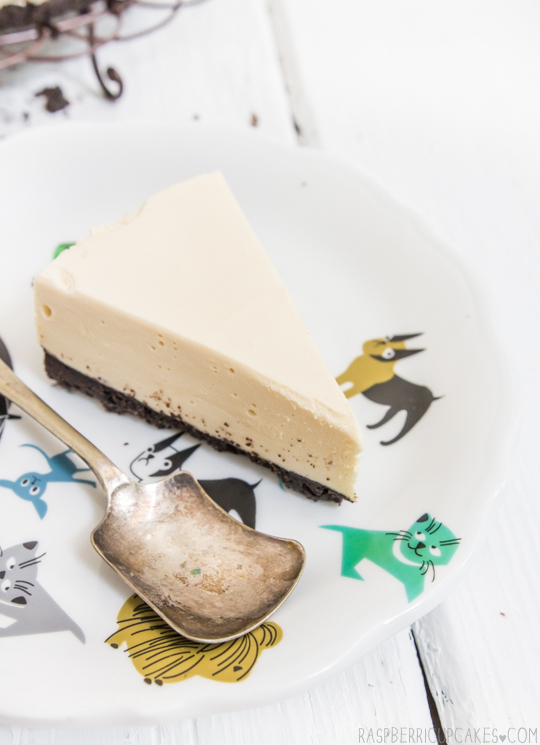 Any old biscuit crust would work great with this cheesecake, but I think the dark crumbs look nice with the fluffy, pale cheesecake mixture in. 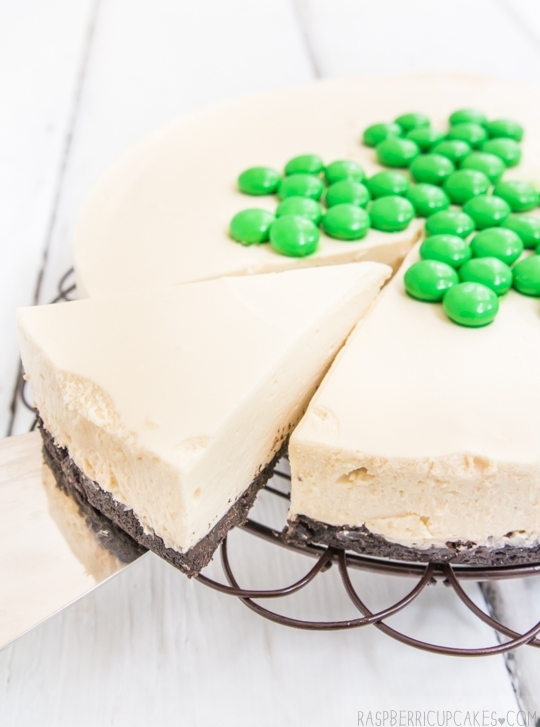 A word of warning; do NOT put green M&Ms on this cheesecake and then put it in the fridge overnight. It will turn into a lumpy green puddle of mess. It's not pretty. 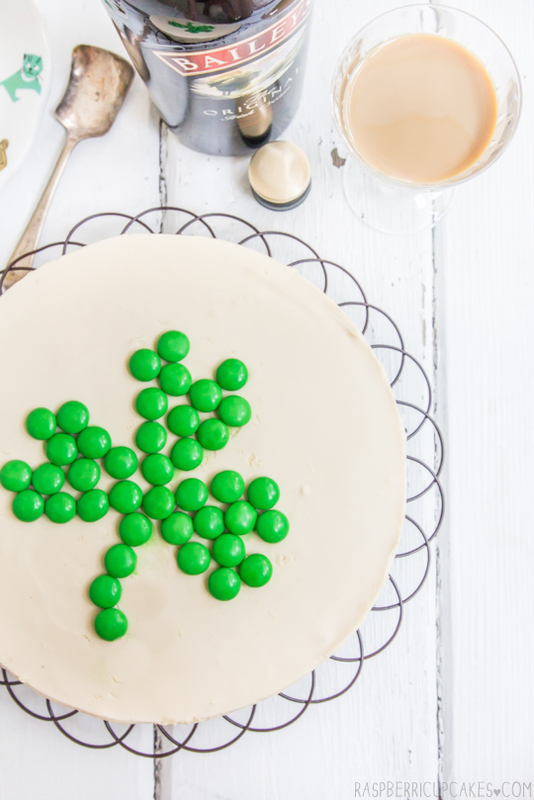 If you do want to decorate it as its seen in the photos, pop the M&Ms on at the last minute. Trust me. Grease and line the base of an 18cm (7inch) or 20cm (8 inch) springform cake tin with baking paper (I used 18, you may want to use an extra half packet of Oreos if using 20cm to ensure a good crust thickness). Whip cream in a mixing bowl until it reaches soft peaks (take care not to overmix). Chill until ready to use. Place cream cheese in a separate large mixing bowl and beat with an electric mixer on high until smooth. Add sugar and beat until combined. Place gelatine in a small separate bowl with 3 tbsp cold water to soften it. 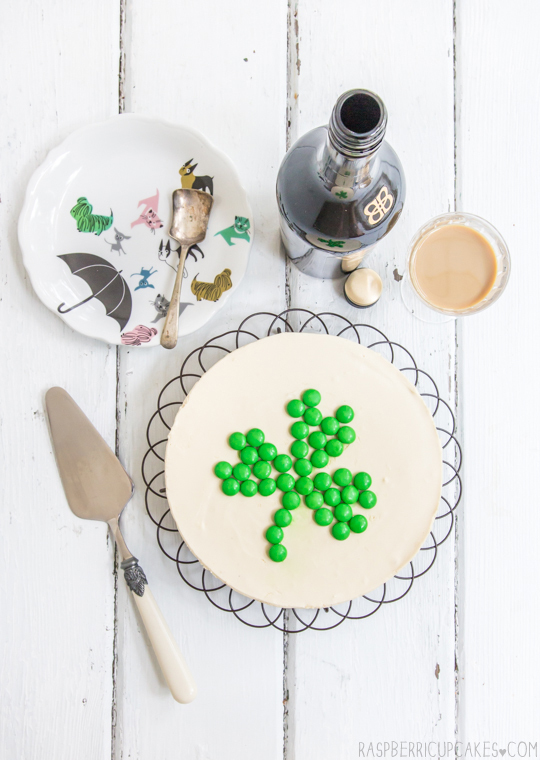 Place Baileys in a small saucepan on medium heat, add softened gelatin and whisk to combine. Continue whisking over heat until dissolved. Ensure there are no lumps. Add warm gelatine mixture to cream cheese and beat until smooth. Fold in whipped cream until smooth and then pour mixture over crumb layer. To serve, run a thin-bladed knife under hot water and then carefully run around the edge of the pan to loosen it. Carefully remove from pan and serve, or store in an airtight container in the fridge until ready to serve. I adore this cake - it looks so creamy and delicious!! I have though a question re the cream - what is thickened (heavy) cream? Is it something to do with the fat content?? Tasty looking dessert and beautiful photos too. Looks delicious. You should make Guinness chocolate cake too, so so tasty! Oh how gorgeous. I think I might have to try this, topped with my Baileys and White Chocolate fudge maybe? Or is that just too much Baileys? Can you have too much Baileys, that's the question. 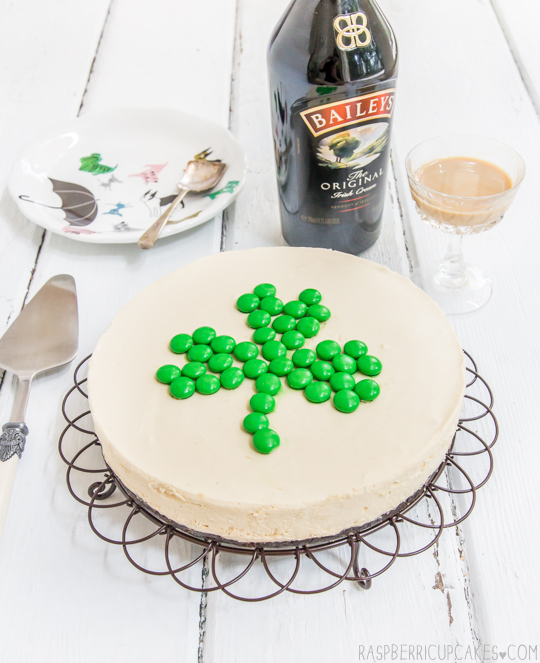 How gorgeous is this - I love Baileys, and could see myself OVER indulging in this. 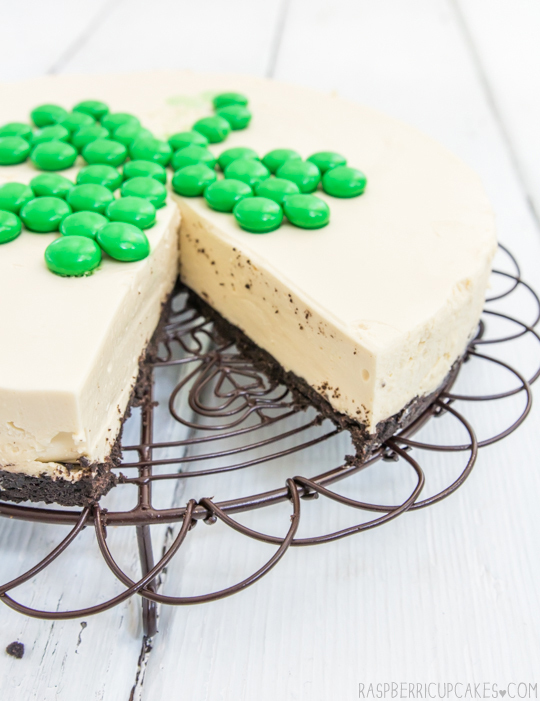 I made this the day after St. Patty's day for a seminar, and it was a hit! I'm a full time PhD student and never have the time to bake or cook, but this was so easy and quick! I even blew away my mentor! Thanks! cant wait to make it again . I substituted the gelatin for agar-agar, and it was still amazing!